The doggy bathroom is an invention waiting to happen – until then, pet owners are stuck with the front or back yard. Your lawn is especially susceptible to turf damage around patches of urine, which will appear as brown dead spots surrounded by a dark green ring of grass. So what’s actually going on when your dog does its business? It leaves a large helping of nitrogen that soaks into the ground and acts as a fertilizer – and not the good kind. These spots burn into the lawn, especially in dry conditions. The best way to minimize lawn eyesores is to water problem areas to dilute the nitrogen. If you want to eliminate the problem entirely, take your dog for walks so they can go in park areas. 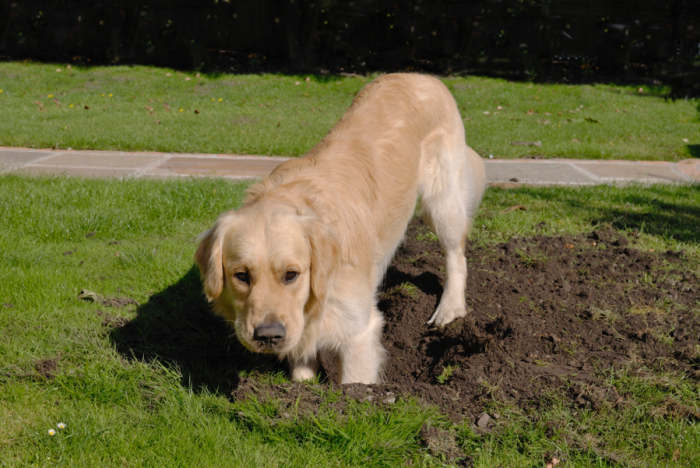 Some breeds of dog are more prone to digging holes in the yard than others, but it’s important to be aware of the possibility if you have a pup. Always remember that your dog is only misbehaving because it doesn’t know any better, not because it wants to wreck your lawn. When dogs get bored, moving dirt below the grass may seem like a form of entertainment. If your dog is a type of terrier, digging is actually a trait bred into them, and they dig to fulfill their inherent curiosity. So how do you stop your dog from turning the yard into a cratered mess? The key is to provide extra stimulation throughout your dog’s day, so they’re interested in other things than the lawn. Be sure to give your dog two walks a day, so they can release the energy that would otherwise go right into digging. When you see your pooch munching away at fresh blades of grass, you may ask yourself whether there is something wrong with your pet. After all, if you’re feeding your dog a balanced diet, why should they be tempted by something as tasteless as grass? The truth is that grass is actually too harmful to dogs, and it’s your lawn that you should be worried about. Grass provides extra fiber for dogs (as long as it has no toxic chemicals), so they may be eating it to improve their overall health. Your grass, on the other hand, does not benefit from being eaten. You may end up with unsightly patches over time and have to do something about it. Reward your dog when they eat their entire dinner, because that will keep their stomach full for time outside. While your dog may not weigh as much as you, they can still damage the lawn by walking all over it. Too much traffic on your lawn leads to soil compaction, making it difficult for plants to spread their roots. Compact soil also prevents water from sinking evenly into the ground, which can kill off patches of grass throughout the growing season. You can’t stop your dog from walking on the lawn, so it’s best to deal with this problem after the damage is done. Look into renting a lawn aerator every few months to loosen the soil. It just takes one pass over the entire lawn to undo weeks of compaction from pet traffic. It’s well worth taking the time to loosen the soil, because it’s much more costly to replace dead grass. Despite the damage a dog can do to a lawn, we still love our dogs for their love and loyalty. It’s entirely possible to have both a healthy lawn and a happy dog; it just takes a little work on your part. If you want to focus more of your attention on taking care of your dog, it’s time to get experts handle the lawn. Check out our residential lawn care services and leave it to our helpful team to maintain a healthy lawn, even if you have a dog. We understand the most common forms of damage and how to repair them, so contact Green Stuff today!